This picture used by permission from the Univ. of Wisconsin LaCrosse Collection. CITY OF CLIFTON Way’s Packet Directory boat 1068, sternwheel packet, wood hull, built Jeffersonville Ind., 1900. 190 ft. 36 ft.x 5 ft. Engines 16′s – 7 ft. Three boilers. She was built for the Lee Line Memphis, christened ROWENA LEE, but was bought by the St. Louis & Tennessee River Packet Co. before she left the builders. They renamed her CITY OF CLIFTON. Capt. R.W. McCoy, master. Sank at Seventy-Six Landing, a short distance above Grand Tower, Ill., in August 1901, raised. Burned at Clifton Tenn. in February 1903. 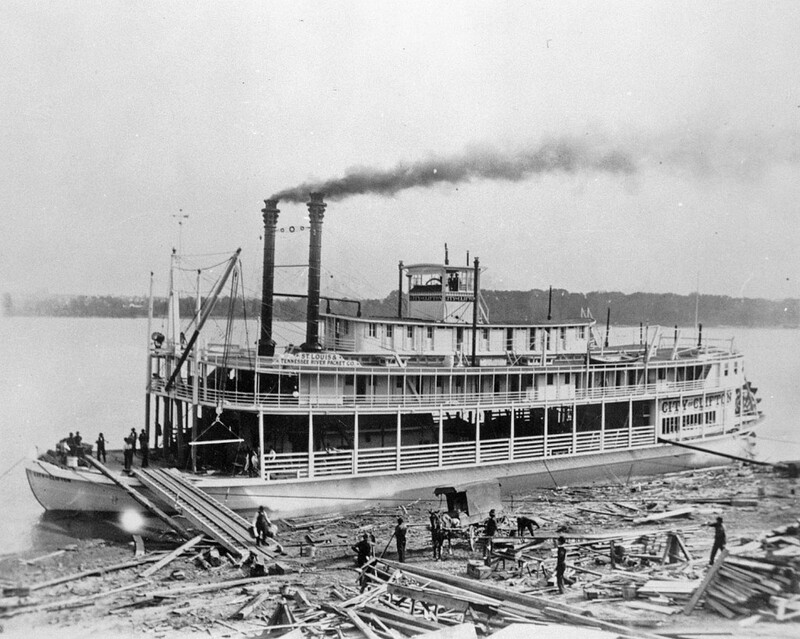 The origional ROWENA LEE was built at Howard Shipyard Jeffersonville Ind., 1890 and was 166.5 ft. x 35 ft. x 4.5 ft. Way’s Packet Directory Boat 4856. She sank at Mhoon’s Landing below Memphis in October 1897 with her head in six feet and the stern in 12 feet. Had 300 bales of cotton and some passengers, removed by the J.N. HARBIN. The ROWENA LEE carried the whistle from the RUTH and it later went to the JAMES LEE (2nd) and then to HARRY LEE. Rebuilt at Howards in 1899. Finally sank for keeps at Tyler’s Mo., just above the Arkansas state line, this in 1902. There are pictures of the City of Clifton after burning on Clifton Tennessee’s website. Cityofclifton.com. Pictures can be viewed by scrolling through the “old pictures of Clifton”. There are two interior pictures as well, plus pictures of other packet boats at the wharf in Clifton. Growing up in Clifton I heard stories about this boat many times. Thank you for your site.